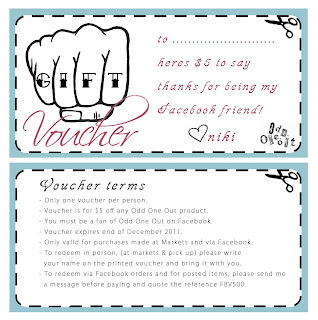 Odd One Out: An anniversary, some thank you's..... oh and a giveaway..... or three! An anniversary, some thank you's..... oh and a giveaway..... or three! It's celebration time in the Odd One Out household this month - It has been 1 whole year since I started up my wee Facebook page and also a year (this month) since I nervously attended my first market. Amazing! It feels like a lifetime but also like I've just started, if you know what I mean. I have met some truly awesome people along the way both customers and fellow crafters - many who have become dear friends. I need to thank some very important people who have helped me along the way - so bear with me and then I will get on to the giveaways. Firstly a massive thank you goes out to Mr Odd One Out. Little did he imagine that my wee hobby would take over both our lives so much. I've always made these things for us, as gifts for friends and family and occasionally orders from friends of friends etc - this he was used to but then I announced that I was going to try a market (just one!) and here we are 12 months later..... with markets every second week or so, a spare room that's not so spare anymore, more plates and odd bits and pieces than you could even imagine and an awful lot of babysitting now done by the Mr. So big ♥s to him. Second big thank you to my lovely and talented friend Koyal. She has had far more faith in me than I have ever had, and pretty much had to drag me kicking and screaming into the market scene. I think she had been cajoling me into having a stall at a market for a couple of years before I finally agreed to share half a table with her last year, and I am forever indebted to her for persisting with me. I truly didn't think that anyone would really want to buy my work and I remember being so nervous and slightly embarrassed at my first market. So thank you miss Koyal for all your encouragement. (By the way she is the most amazing knitwear designer so go and check out her Facebook page too) Here we are at one of my first markets - Crafternoon Tea in Kingsland. 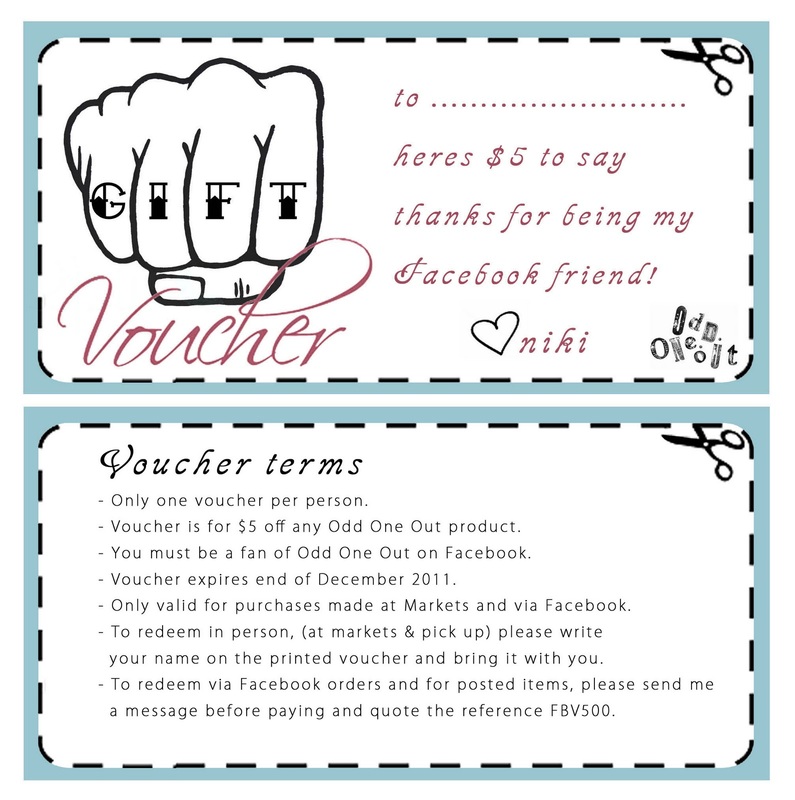 ﻿For all the lovely people that have supported me at markets and have bought online here is a $5 voucher that can be used until the end of the year. Please print it off and bring it with you to markets or quote the reference number before paying for Facebook orders. I have a very curious (read nosy) nature and I love to know what happens to the things I sell - where they go, how they are displayed etc. So this draw is for everyone that owns a little piece of Odd One Out. It could be a plate, portrait, lamp or cushion - even jewellery. Just take a photo of it in its new home and email it to me. I will put the pics up in a little album on my Facebook page and everyone will go in the draw to win their choice of my illustrations on a vintage plate. Woohoo! Just one picture per person please - I know some of you have lots of plates! I will announce the winner on my Facebook page on the 12th November - you will need to get in touch with me by the 15th November or I will draw another name. I'm looking forward to seeing what designs you all choose! Congratulations on your anniversary, I'm looking forward to extending my collection of plates by the time your 2nd anniversary comes around! I love the 'Mr Stag' design, if I don't win the competition, he's my next purchase! Congratulations on your 1 year anniversary; your plates are just amazing! I have one of your "fait l'amour pas la guerre" that is ready to go up once we buy a house! I would love the "let them eat cake" plate to go with a plate of Marie Antoinette I have that is waiting for me at the inlaws in France! ahhhh so hard to choose just one! i adore them all! let's go with "you're my cup of tes" as that was the first of your plates i discovered! I love the Yo bambi! plate. I actually have some plates from the Crown Lynn Autumn Splemdour range so to have a hand painted one would be an awesome addition! Congratulations Niki on your 1 year, its such an achievement and great to meet you today, I am in LOVE with my plates and have my eye on 2 MORE!!! Desperate to know when your next market is, yay! I'm after the 'Mr Stag' and the 'Home Sweet Home', but you never know I might be the luck winner of one, he he! Congratulations, love love love your work. If I won I would choose one from your shadow puppet range, very clever. This is easy as I already have a spot saved in my kitchen for the 'your my cup of tea plate'. Congrats on the year milestone, sure there are plenty more exciting times ahead for you venture! "Ants" LOVE it!!! Love how different it is and underneath the food- arrrhh ants! I love your work and my absolute favourite is Shadow Wolf... although its so hard to choose. I would love to win 'You'r emy cup of tea :) Love you work, clever lady! love so many, but keen, keen, keen for a cup of Rosey Tea! (youngest girl is called Rose). Thanks Niki, Great Comp! Congrats darling. Your so amazing : ) Keep up the good work. I would LOVE any one of your plates. I love you plate is my fav today- I change my mind so often with your plates, I think if I had a money tree my hall would be lined in them! Great idea of showing your customer pictures! I have changed my mind on my choice of plate, difficult cos there are SO many I like, instead of a cup of Rosey Tea, I think I need a cake fist on a really pretty old fashioned rose and guilded type plate. Whoever wins will be so happy I'm sure. Absolutely love your plates! And follow you on facebook and now your blog. Please enter me for the 'Octopus' plate - I just LOVE IT!! Congrats on your first year, your plates are absoutley awesome! I would love to win one eyed lady, if I don't win it, it will be my next purchase for sure! Most eye catching for me would be - vintage Crown Lynn willow plate - now with Anchor & in blue porcelain paint to match. Love your plates, am going to try and get to the next crafternoon tea. Love the Shadow Bird in the Shadow puppet range. My name is Niki. I describe myself as a maker of stuff, collector of everything and rescuer of the unused and unloved. Odd One Out pieces are all hand made by me and are crafted from predominately recycled materials. I just love that my work combines so many things that make me happy… design and illustration, textiles, fashion and of course op shopping, scouring markets and collecting random objects. This little blog is for sharing my work, my inspirations, my fabulous vintage finds and... well probably some other random things from time to time - hope you like it! All photos and content on this site are © Odd One Out 2011, unless stated otherwise. Please contact me before using any of my photos or content, and please remember to credit me 'Odd One Out' as the source with a link back to my blog. All designs copyright Odd One Out 2009. Powered by Blogger.